Don’t let the “messenger” bag part fool you. This is not one of those huge over the shoulder bags, but rather a compact bag, made in the messenger bag style – large front flap and a strap that can be worn over the shoulder or across the torso. The strap can also be shortened and then the bag can be worn as a fanny-pack. Very versatile. The bag could last forever, being made of what they call “bombshell technical fabric.” The bag is waterproof, abrasion resistant and comes with a durable nylon mesh core for long life. The nice, soft and smooth exterior skin won’t snag or fray your clothes. This is not a bag for standard DSLR owners – it won’t fit your big Nikon or Canon cameras. This is aimed at the compact DSLR market only, as well as the new micro four-thirds market. For those owners, this bag is ideal. With a main compartment divider, an accessory storage pouch, as well as an exterior zippered area, you can carry extra memory cards, batteries and filters. The Union Kit Messenger is available now for $44.99 on the Acme Made website. 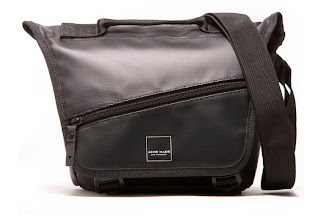 As camera bags go, that’s a great price for a bag this durable.